The three things I look forward to most for fall are the leaves changing, the opening of the Franklin Cider Mill, and the 800-page Vogue magazine with all of the new ad campaigns. In my research over the weekend, I was very excited to stumble upon some first looks for the Fall 2010 campaigns of a few major designers. Most I think are absolutely stunning, but there are a couple I'm not as crazy about. 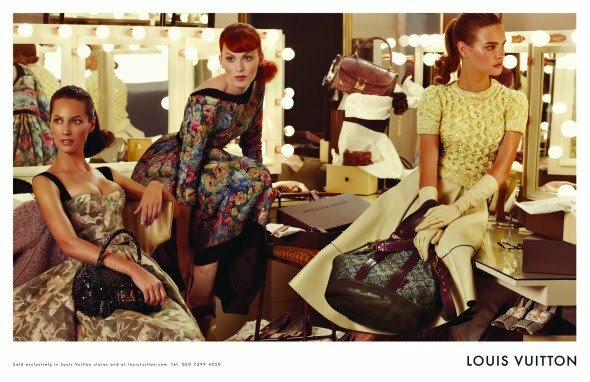 Three beautiful women, a 50s-inspired shoot, stunning LV bags, it couldn't be more perfect. Shot by photographer Stephen Maisel and styled by Karl Templer, Louis Vuitton hit this one out of the park. Fashion models Christy Turlington (left), Karen Elson (center) and Natalia Vodianova (right) look flawless donned in LV couture, and I am extremely excited to see the rest of the campaign. Also shot by Stephen Maisel, there is another distinct 50s-theme going on in Prada's new ad campaign. He obviously had a vision and it is most definitely working. Muiccia Prada had models Angela Lindvall, Valerija Kelava, Daria Strokous and Sigrid Agren (main model) looking their Prada best in this two-page spread. Well, hello boys. Photographer Steven Klein certainly knew who his intended audience was when he shot these five beautiful male models in a tailor shop. Perfect bodies, perfect wardrobe (or what's there of it), what's not to love? I cannot wait for this spread to be front and center in Vogue. These are just a few pre-fall ads for Gucci's Fall 2010 campaign, and I am in love. If these are just a preview, I am dying to see the full campaign. Aside from Louis Vuitton, Gucci is my favorite for this fall. While there aren't any previews out for Fendi couture yet, they have released a fall ad for their newest fragrance, Fan di Fendi. Anja Rubik, Karmen Pedaru, and Abbey Lee Kershaw are the hot trio spraying this F-shaped bottle on themselves in a black, white, and gold photograph. I already own a phenomenal perfume, but this ad definitely makes me want to go see what this new scent is all about. Sadly, I'm not all that impressed with the shots featuring the tan trenches (which have always been my favorite). The coats are beautiful, as are the people, but the shades of vomit green just don't quite work. I like the thought behind it - including models (Victoria's Secret model Rosie Huntington Whiteley), actors, and musicians, to get a more "real-world connection" feel from the campaign. The second style, however, is how it should be done. Focus on the trenches and bags, which are both beautiful in this ad. That's what Burberry does best, and it should always keep that in mind when shooting campaigns. Blah, blah, blah. Not that I've always thought that Valentino had the most exciting of campaigns, but this is pretty lackluster, even for him. David Sims photographed up-and-coming model Tati Cotliar for this ad. Overall, I think the designers, photographers, and stylists did an amazing job, and I am anxiously awaiting the September Issue of Vogue to see these ads and more on display.